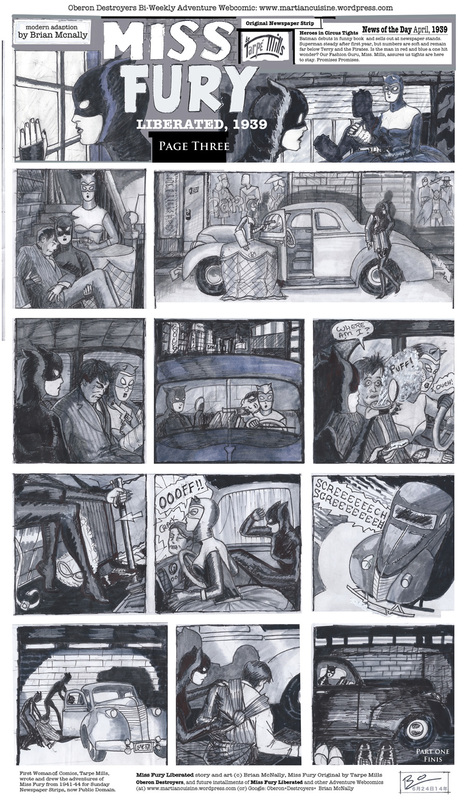 …Brian McNally's Comics Blog for Arts, Culture and Bits. New Miss Fury Liberated, 1939. The silent page! The next Miss Fury Page may take a few months, as I have to pick up other neglected titles and roll out some fun new stuff. Page three and last chapter of part one. If anyone wants to see more Miss Fury Liberated 1939, then they better got to Contact and send me a message. Feedback will always get me interested in doing more of a particular title. My current project is the same era as Miss Fury (1939 vs. 1938) so check back for that information , to be posted in one week. It’s a pulse pounding pulp story called “Three Against Satan.” Soon! (click to enlarge. Featuring Special Guest Villain Damien Guido). Target Date for Page 3 – July 9th. Enjoy! Page Two (follows this sequence) is fully drawn and inked and just needs word balloons. This Wednesday or Tuesday night maybe if I feel ambitious. Page two looks good, btw. Better than one. Peter Lorre may toddle in at any moment as the one armed man. The recent collection Tarpe Mills: Miss Fury, Sensational Sundays 1941-1944 Tarpe Mills, edited by Trina Robbins is a great source for the original strips, now public domain. Full Page One – the one coming tomorrow will have the next installment in one women’s adventure. Click to enlarge. (Her original strip for Sunday Newspapers is now public domain). I would say its pretty much 50/50 Mills/Brian on story, style, same vs. different panels. As you can see the story veers off in a quite a different direction (before coming back around, lots of fun turns), and the dialog is a lot more me than Mills. 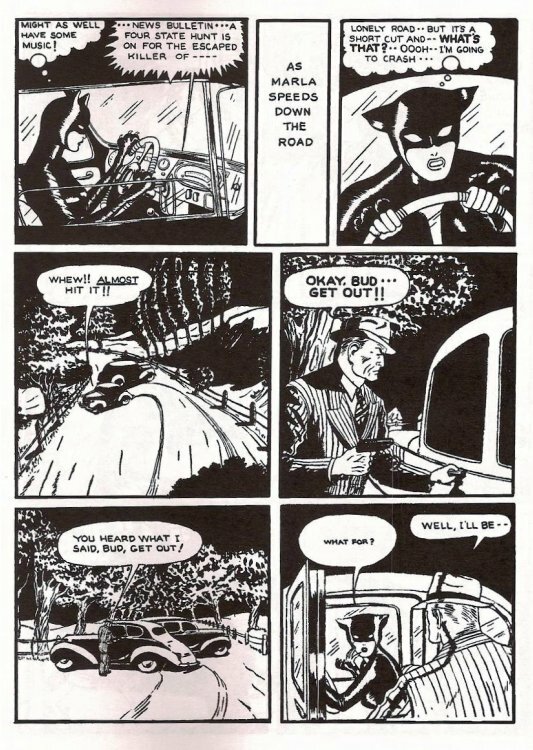 Mills is known as a brilliant storyteller but also a writer of clunkly dialog common to most comic writers of the time. I gave the dialog a much hipper, charming edge that matches the rest of what she did, restoring her spirit to the words. It’s really about what comes after page one…. I love Mill’s Miss Fury, and true love is a 50/50 propostion!! 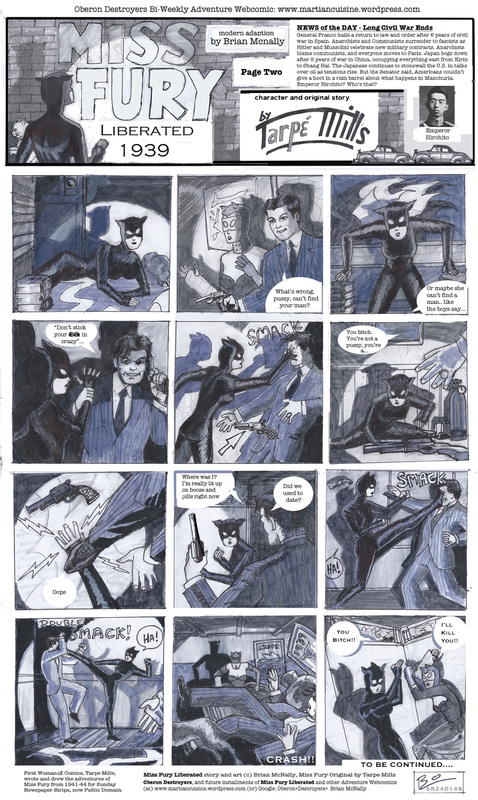 ORIGINAL MISS FURY/BLACK FURY by TARPE MILLS, 1941.
that appeared in the Sunday papers. These are black and white versions of the originals in color. Left to right. Original (like mine) was done on a 12 panel grid. These pages were formated for reprint by Timely Comics later in the 40s and 50s. click to enlarge. Its 11×17 or 1000 pixels wide, about 1.5 MB.